Don't ask for paper OR plastic the next time you're in a grocery store. Instead, pick up a couple of cloth shopping bags. Every major retailer in our area offers these bags at checkout. They're tough, they hold a lot, and they can be used again and again. 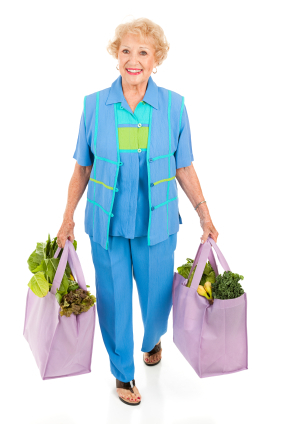 Apart from store-brand cloth bags, you can also buy cloth bags online and at many retailers. Be sure to purchase bags made of cloth, not recycled polyester. Why Use Cloth Shopping Bags? Making and transporting plastic and paper bags takes up heaps of energy. What's more, paper bags are made mostly from trees, not recycled paper. Plastic bags are made from byproducts of oil or natural gas. Both paper and plastic bags, when not properly recycled, add to our garbage problem. Plastic bags, especially, clog public drains, spoil our landscape and harm marine life. Switching to cloth reduces our dependence on fossil fuels. And helps preserve our environment.